Between the recent heat of the day and the rain and wind at night there are few opportunities for shooting Blue Banded Bees. It’s only when they are either feeding or sleeping that they are at all approachable. During the day they rarely stop for more than a second or two at a flower and I don’t have the equipment for that. So I walk the garden at dusk listening for the tell-tale sound as they approach and select a place to sleep for the coming night. Sometime during the night I will set up a shot or two and the primary concern is to not disturb them. If they wake they will fly into the dark and may be lost to the night hunters, of which there are many. 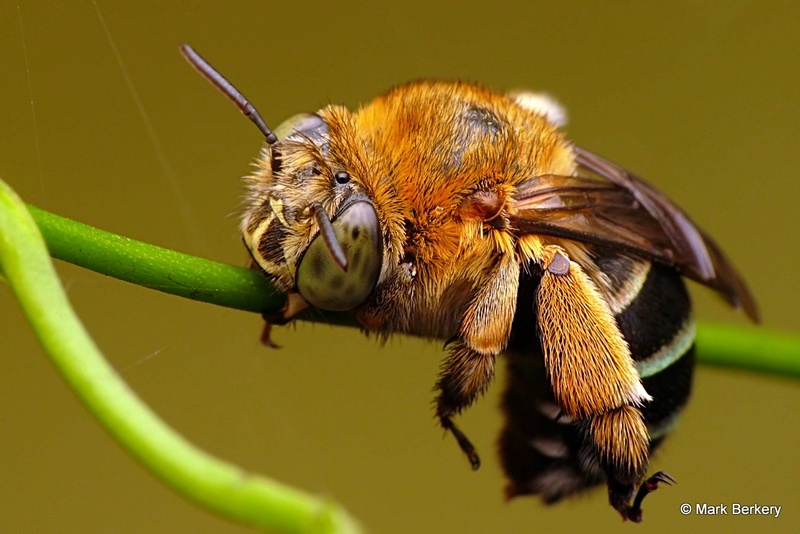 It’s why the bees sleep where they do, gripping a stem off the ground and at the end of a branch where there is no through traffic or passers by, to increase their chances of waking in the morning – they are not stupid. And if a predator does happen upon one during the night it will automatically splay its legs in all directions to make itself bigger and would be a bit thorny to eat, with its hooked feet the first contact. Once the morning comes they are up and about before any other bee I know, hardy little creatures, bullets of blue and red and black darting about, with purpose. Even when it’s raining heavily they are up and about, a pleasure to watch, the way they control their flight in tight spots in their search for food – known to favour blue flowers. My what big eyes they have. How do you find where they sleep at night Mark? Despite having them busy around my garden for years I’ve never seen where they perch. The males perch together – where do the females go? Hi Lissa. In my garden I listen at dusk for the buzzing a few bees coming and going make as they select a place for the night – once selected that generation seem to stick to that spot unless some drama or trauma occurs. As the light dims they start to arrive ‘home’ and settle just before dark, so there’s 20 (or so) minutes to hear/see them. The males will find a stem to grip in their mandibles (jaws) and lock on for the night – unless disturbed. At present they are attaching to low hanging stems of star jasmine on my side of the fence – used to be on the other, they sometimes have slept on bare fern stems I gathered and presented for them, where there’s long grass they will sleep near the tops of the stems – but always near a nest site, I suspect, where (I believe) the females will probably sleep – like other such native bees, the Orange Tail Resin bee for instance. The only rules seem to be a structure they can grip, away from ‘traffic’, relatively sheltered – except for in a field of long grass where they are under the sky but also catching the early sun – and probably near a nest site. That’s my observations anyway. I have heard of someone tying twine from gutter to wall under the eave and have BBB’s sleep there. It wouldn’t harm to offer a ‘suitable’ place and see if they take to it. Thanks for the pointers. I often wander around after dark with a torch to see what is going on in my garden, but perhaps am busy in the kitchen at dusk. Will have to make a point of being out there at that time to see if I can find their pozzie. I know where the females nest – down one side of my brick house, inside the brickwork – so it would make sense that the fellas are hanging out somewhere down that side of the house too. Wow these are beautiful shots …..bees amazing!! Thanks Therese – they are wonderful creatures. Thanks Leni. They also talk to each other, and have fun chasing around the garden. That first shot is fantastic. Bees being bees and you being you. 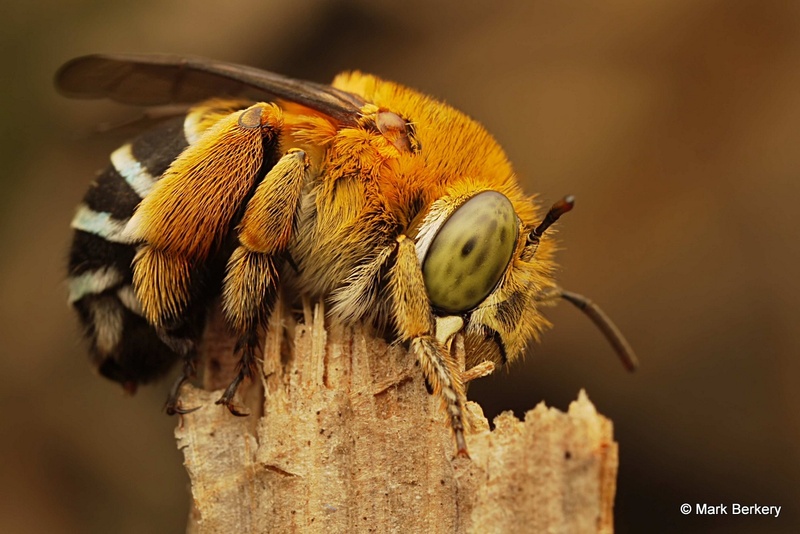 Very interesting post and bee and fantastic photos. This is a terrific post, Mark. 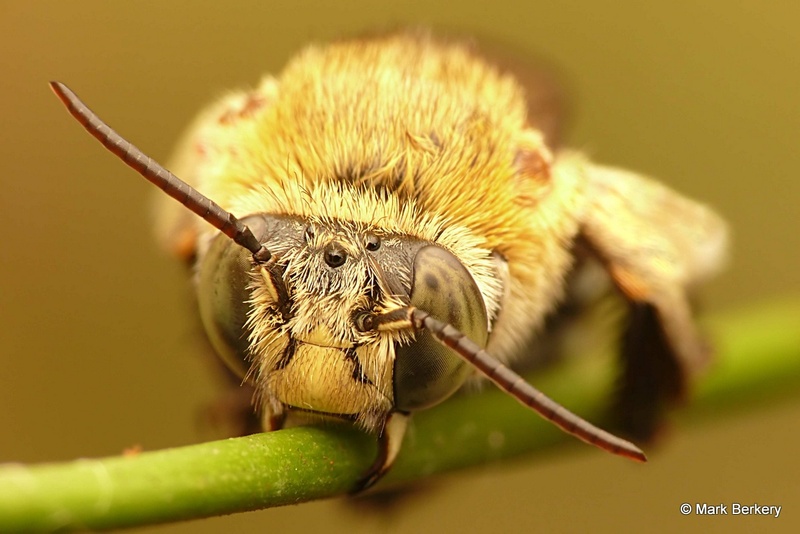 I appreciate not just the photos, but the information about these beautiful little bees. And, as always, your gentle, respectful approach. You consistently take such incredible photographs! I do my best Paul, and bin many too. Wow, what an incredible shot! with me as his companion! Your capture of this beautiful creature napping… made my day. They like the white flowered basil too. Interesting – I didn’t know that some bees will favor one flower color over another. But when I think about it, it makes sense. Yes, it makes sense. There are so many creatures partial to some thing or other. Doesn’t mean they can’t do without it, though some apparently can’t.